Dr Azad's attackers, might have come right out of his book, Pak Sar Jamin Sadd Baad (Pakistan's national anthem: Blessed be the Sacred Land). It depicts the story of a religious fanatic who wants to establish a "Taliban-styled distorted Pakistan" in Bangladesh. The protagonist, a member of the Jama'-e-Jihad-e Islam Party, says in a monologue, "We aren't alone. Our brothers all over the world are doing their work. If they fly an aeroplane into a building somewhere, if cars crash into a hospital or a hotel, or if a bomb blast kills 300 people in some recreational centre, then we know it's the work of our brothers; in other words, it is our work. This is Jihad." The name, Jama'-e-Jihad-e Islam Party, is believed to be an allegory to the Jamat-e-Islami Bangladesh (JI), a partner in the ruling coalition; as another character in the book, Karim Ali Islampuri says, "We must seize power. Right now, we are with the power and the main party. At some point, power will come to us; we will become the main party. We are entering everywhere -- Islam will be established; (another) Pakistan will be created. There won't be any infidels, Malauns (Hindus); there won't be any Hindu or Jew in guise of Muslims." Dr Azad's novel, however, meets a melodramatic end. The zealot goes through a dramatic change of heart-- he falls in love with a Hindu girl; and later abandons the path of religious bigotry and intolerance. 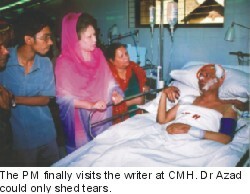 But in real life, Dr Azad had been fearing for his life since the novel was first published in the Daily Ittefaq's Eid supplement in 2003. In an email to Muktomona, an independent website, he wrote, "The Ittefaq published a novel by me named Pak Sar Jamin Saad Baad in the Eid issue in December 3. It deals with the condition of Bangladesh for the last two years. Now the (religious) fundamentalists are bringing out regular processions against me, demanding exemplary punishment. The attached two files with this letter will help you understand." Along with the mail Dr Azad sent JPG files that included news of protests against him. In fact, on January 25, Delwar Hossain Sayeedi, an MP belonging to JI called for the introduction of the Blasphemy Act to block the publication of "such books". Besides Sayeedi--who once called for blood tests for journalists to see "if they are Muslims or not"-- many bigots have declared the maverick writer a murtad (apostate). From an anti-Ahmadiyya rally on December 12, Momtazi, emir of Hifazate Khatm-e-Nabuat Movement and the Imam of Rahim Metal Mosque demanded the professor's arrest and trial. 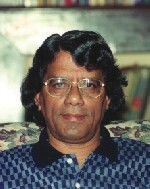 Nothing has ever deterred Dr Azad, perhaps, the lone outspoken writer in Bangla literature, from speaking out his mind. Azad has even denounced some of his contemporaries, describing their novels as opponnayash (degenerated novel). Be it in writing against military bureaucracy or dictatorship in the guise of democracy, Dr Azad, with his iconoclastic views, has always stood out. Though, teachers at the university have been divided along the line of their political allegiance, Dr Azad has kept a safe distance from both the BNP backed White and AL backed Blue factions. In fact, Latifa Kohinur, Dr Azad's wife, cannot remember him going to the polling booths, even, to vote for the general elections. Though everyone does not subscribe to his opinion, Dr Azad's writings have always generated much enthusiasm among the readers for his fierce criticism of the establishment. But through his candid statements on the political use of religion, the writer has certainly earned the wrath of a certain quarter. Actually, according to Latifa, the writer used to receive phone calls "five or six years ago" that threatened to kill the linguist for writing "un-islamic" things. "I used to get phone calls five or six years ago…They would say, 'You will get Humayun Azad's corpse on the street… You will be a widow soon', and so on," Latifa says. But the threats suddenly stopped coming in one day. Even after the publication of Pak Saar Jamin Saad Baad, the family members did not receive any such call, Latifa says. But she became anxious for her husband's safety when "a religious fundamentalist outfit called for Dr Azad's trial and the banning of Pak Saar Jamin Saad Baad ". That anxiety turned into fear after Sayeedi's infamous demand in the parliament. Latifa couldn't hide her anger on the night of February 27 at the CMH. "Fundamentalists (zealots) have done this… Who else could do this? You know an MP even verbaly abused him in the parliament," she said. "Why didn't you take security measures to protect him after such an outrage in parliament?" Latifa asked Lutfuzzaman Babar, state minister for home, when he went to visit Dr Azad in hospital. 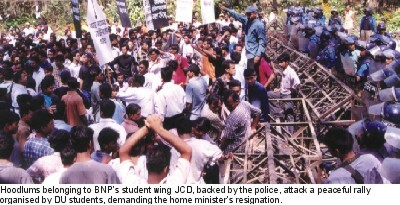 Though the police had claimed to have "cordoned off" the area immediately after the attack, the agitating students of Dhaka university, who had been demanding the home minister's resignation, recovered another blood soaked Chapati (chopping knife) from the spot on the following day. The police, however, arrested Abbas, alias Boma Abbas, joint secretary of Sir AF Rahman Hall unit of Bangladesh Chatra League. "We have information about his presence near the spot before and after the incident. And there was a bomb explosion during the attack, he might be involved in the crime," Officer in Charge of Ramna Police Station Mahabubur Rahman said; Abbas has a history of bomb-making, the police officer alleged. The case was later handed over to the CID; and though the state minister for home has promised to give the case highest priority, the police are yet to unearth any motive behind the attack. The attack on Dr Azad and the police's failure to nab the culprits have angered general people. 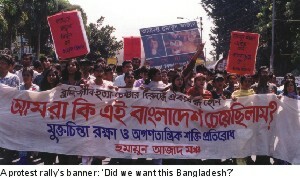 The Dhaka University Teachers' Association has called an indefinite strike demanding the home minister's resignation. The anger turned into fury when armed hoodlums belonging to the Jatioyatabadi Chatra Dal (JCD), attacked peaceful procession of the general students on March 4. It is not clear, though, as to how a peaceful demonstration demanding the arrest of Dr Azad's killers can anger the ruling party's student wing. To save its skin the government resorted to suspicious secrecy. When, immediately after the attack, the country held its breath to hear the latest condition of Dr Azad, the government even barred journalists from entering the CMH premises. It was an irregular, and in cases irresponsible, press-note of the Inter Service Public Relations that became the sole source of information for the anxious general people. The government's suspicious behaviour gave birth to a wide spread rumour of his death. Some government officials, when asked, came out with reports on his condition that were self-contradictory. Lately Azad's condition has, however, improved; and rumours died down when members of his family and Dr Azad's friends were allowed to visit him. The attack on Dr Azad, in every sense, is shocking. Though religious fanatics have declared many writers and intellectuals as apostates, in fact, this is the first time in our history, that a writer was physically assaulted for his work. The attack, in front of Bangla Academy, one of the glorious products of our language movement, sends a chilling message to those who still believe in freethinking. Everyone wanted to reap dividend from the attack on Dr Azad. While Dr Azad was fighting for life at the CMH, leaders of both the major political parities and intellectuals of their creeds kept themselves busy interpreting their own version of the event. "I just want to see the man back home," says Latifa Kohinur. After 33 years of independence we cannot even be guaranteed security for our lives; forget free speech. It was hardly a big surprise when PM Khaleda Zia accused the AL of perpetrating the barbaric attack on noted litterateur Humayun Azad amid thunderous applause of a crowd of several thousands of a public meeting. It is the same old blame game where the government always accuses the opposition and the opposition retaliates by charging the government for every mishap or crime that occurs. Politicisation has been taken to a new level. It's no more just the police or BTV, history and National Days are being politicised. Politicisation is spreading its root and branch. Be it a bomb blast or a price hike the government invariably smells the opposition's foul play in it, while the opposition always points figures at the 'government's failure'. By resorting to wholesale accusations against each other instead of addressing the real issue, which though may earn them temporary success, in the long run they are losing their credibility. Unfortunately, our wise politicians seem to be unbelievably incapable of realising the gravity of the risk they are running. Just take the most recent example. Only 15 hours into the barbaric attack on Humayun Azad the PM blamed the AL, alleging that the attack was meant to create panic ahead of an AL-sponsored hartal. But she didn't provide any solid proof to substantiate her claim. Interestingly, she made the revelation at a time when the police investigation had just begun. And if we consider the fact that the investigation is still on and after 8 days since the PM's claim the police are yet to make any breakthrough into the case, the PM's declaration seems premature and undesirable in retrospect. Such rash comments might very well make objective investigation impossible. Given the highly politicised nature of the police, it is quite likely that instead of conducting the investigation objectively the police might try to prove the PM's 'guess' right. What happens in the process is that the real criminals are allowed ample time and scope to melt in the air and plan for the next target. That is exactly what has happened over and over again in the last few years, not only during the present government, but also when AL was in power. The way today's PM Khaleda Zia has hurried onto the conclusion that the attack on Humayun Azad was made by AL, appear to be almost a replay of the then PM Sheikh Hasina's allegation that BNP was the mastermind behind the tragic Ramna Botomul bomb blast that claimed 11 innocent lives. Another ghastly bomb blast in Paltan Maidan in a meeting arranged by the Communist party that killed seven people was also met with objectionable observations from Sheikh Hasina. She suggested that the bomb blast was a result of internal conflict of the Communist party within hours of the incidents, an accusation based on no evidence whatsoever. The consequences are before us -- not a single criminal behind any of the high-profile sensational bomb blast incidents that left behind scores of dead bodies and hundreds of permanently maimed, mostly innocent persons, has been brought to justice. Bomb blasts have continued to kill innocent people and our political leaders have continued to capitalise those incidents for their petty political gain. But it has to be stopped, right now. We all have to raise our voice so that the government and the opposition don't play the blame game exploiting the barbaric attack on the life of Humayun Azad and are forced to find the criminals and bring them to book. We cannot allow terrorists to silence the voice of freedom. March 6, 1999: A bomb blast at an Udichi function at Jessore kills 10 and injured about 100. A veteran left-leaning political leader Kazi Aref is among the dead. October 8, 1999: A bomb blast at Ahmedia Masjid in Khulna claims 8 lives and wounds 30 others. 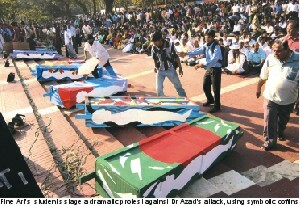 January 20, 2001: 7 persons are killed and 50 injured in a bomb attack at a CPB rally in Paltan Maidan. 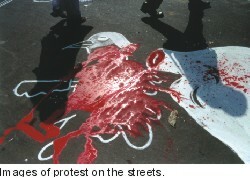 April 14, 2001: A bomb attack on a gathering at Botomul on Pahela Baishakh kills 10 and injures 50. June 3, 2001: 10 persons are killed when a church is bombed at Baniarchor in Gopalganj. June 16, 2001: When a bomb explodes in the Awami League office in Narayanganj 22 persons are killed. September 23, 2001: 8 persons are killed and more than 100 injured in a bomb attack on an AL public meeting at Mollahat in Bagerhat. 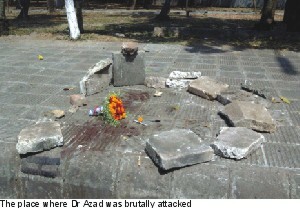 September 26, 2001: A bomb attack near an AL public meeting in Sunamganj kills 4 persons. September 28, 2002: A series of bomb blasts at Roxy cinema hall and inside a Circus tent at Satkhira kills 3 persons and wounds more than 100 people. December 6, 2002: Bomb blasts in four cinema halls in Mymensingh kills 27 and wounds more than 200. January 17, 2003: A bomb blast at a fair in Tangail kills 7 and injures 20. 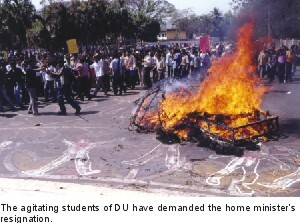 March 1, 2003: One police sergeant is murdered when unidentified assailants threw a bomb targeting him in Khulna. March 11, 2003: Two police constables are killed in a bomb blast..
September 6, 2003: An Awami League leader is killed in a bomb attack. January 15, 2004: Journalist Manik Saha, a long time Khulna correspondent for the Bangla daily Sangbad and a former stringer for BBC is killed in a bomb blast, allegedly the work of outlaws. January 12, 2004: 12 persons are killed and 30 others injured in a bomb blast at the shrine of Hazrat Shahjalal in Sylhet.